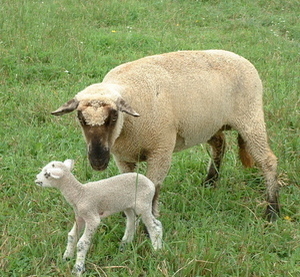 Posted on Tue, Mar 30, 2010 : 11:30 p.m.
A local lamb enjoying a day in the pasture. Do it yourself. Wild food fans and foragers are exactly the types to taste the unknown, try new things for the fun of it and not wait until a food is washed and free of dirt before consuming it. We’ve already stepped off the path of packaged, cleaned and processed food, Styrofoam and plastic containers and antiseptic packaging. Food to mouth means no one else has approved or prepared the food for us, and food safety is literally in our hands. Any successful food forager knows the basics for his or her area - the look-a-likes (poisonous or toxic plants are similar to safe ones), the areas to avoid (near railroad tracks, power lines and manicured lawns, all places of likely chemical spraying). We know to taste before eating and to spit out anything that tastes wrong. Wildcrafted food comes from strange places - marshes and forests, above the ground and in the muck. Anything is possible, and so many things can be tasted, no matter how they look. Flavors are expansive and often new. Foragers are adventurers and experimenters. Isn’t it dangerous? That is one of the first questions so frequently asked about wild harvesting. Are the foods in the store somehow safer, approved and more comfortable? For many people what is real comes from a store. Anything else? Too strange and too risky. Even a few decades ago, no one would think twice about finding an apple tree on a walk, and tasting the ripe apples. Picking berries out in the woods and cramming them into your mouth by the handful. Even digging up a bit of sassafras root to nibble on or pulling up a cattail root, fresh from the stream, to crunch between your teeth. Or sharing a dipper of milk, fresh and warm from a family cow. Living life is a little different after even a few years of eating in the wild, and the ancillary effects are life changing. There is increasing interest not only in wild foods, but also in homegrown, do-it-yourself, not-from-the-store foods. And as we adventure off the path of normal and “approved,” individuals have to take greater responsibility for what they put in their own mouths and what they feed to their family and friends. It is surprising, and frustrating, that this independence and exploration will at times meet a brick wall, the federal government and local authorities. Working for us to protect us, they can also deny us access to foods we might choose to eat. That ranges from protected and endangered plants to farm-raised meat that isn’t inspected or unpasteurized milk sold to the consumer as part of a “herd share” agreement, where the consumer buys a share of the herd in order to enjoy the milk produced. 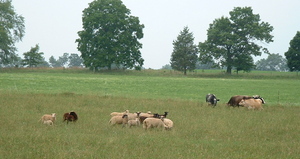 Pasture fed cows and sheep at a local farm. This last weekend, a dairy with a couple hundred members abruptly quit supplying milk to those members. There were allegations of bacterial contamination in the milk that were being investigated with no evidence yet of the contamination. Yet there were also a number of herd share members who believed they had gotten sick from milk that was contaminated. The state and federal governments moved swiftly to “protect” the public, even though there were no actual members of the "public" involved. None of the milk was sold commercially, and no one who didn’t own a part of the cows had access to the milk. It was a private arrangement, which had purposely (and unsuccessfully) removed itself from government oversight and regulation. There are a multitude of side issues and questions, for which there are few black and white answers. Is raw milk safe? Can you get sick from raw milk? Is there a conspiracy against small farmers from the larger agri-business interests? Should private arrangements for food be regulated the same as commercial products? To what degree should people be allowed to make their own decisions about what is and is not safe to eat? You might think that the answers would be simple, even non-negotiable. Local food is good, organic and sustainable foods are the best, small farmers should always be supported. But when it comes to the realities of living those principles, making those decisions, it can get complicated. And personal. And people can get hurt. They may put their livelihoods at risk and lose; they may get sick from someone else’s error or sloppiness. They may end up breaking the law. I have many feelings, having seen people I care about be frightened, having to watch people I’ve come to know and respect lose their primary source of income. Having to scramble myself to ensure I have access to the foods I find keep me healthy. Discouraged after being insulted and ridiculed after posting comments on AnnArbor.com this past week supporting raw milk and asking that a farmer be considered innocent until proven guilty. There are many good things coming to pass in the locavore movement. Ann Arbor is a leader in awareness and activism around food and food politics. But as we step further down this path, exploring both new and very old options, there are going to be some casualties. People doing their jobs, thinking they are making us safer, and a whole other concept of what is safe and what is fair having to emerge. This isn’t just about food preferences, it is about fundamental freedoms and rights. It is about considering that you might be wrong, and being willing to accept new ideas. Some food that we think is safe is not, and some that we think is dangerous is actually making us healthier. I hope we can do this paradigm shift with kindness, with compassion, and especially with wisdom. I ask that of the state and federal regulators, as well as those of us with passionate opinions and judgments about what is right and wrong. I’m trying to do better. Linda Diane Feldt is a local Holistic Health Practitioner, writer, and teacher. You can follow her on www.twitter.com/wildcrafting or check out her Web site www.holisticwisdom.org. @Winkie There is no question that pasteurization has saved lives, and was essential in stopping massive contamination of milk that occurred as cows were brought into cities, and at the start of more intensive herd management. The current day intentional raw milk dairies practice hygiene that was unimaginable in that time period. So looking at the history of raw milk and pasteurization is a bit tricky, if you only look at a few select periods of time. I also fully support pasteurization of conventional milk. The conditions surrounding how most cows are raised are indeed frightening. I do think it matters if the food is prepared for a supermarket, or a private arrangement between farmer and consumer. I don't hear private consumers asking for more government involvement, I don't hear people asking to have it both ways. And there is a lot of illusion about food safety, and the integrity of what is on supermarket shelves. The government isn't doing a great job, and in some areas of food safety is doing a lousy job. That is partly why a do it yourself mentality is emerging. Knowing the farmer, picking produce yourself, asking questions about pesticides and herbicides and farming practiced. The misinformation and scare tactics used to try and shut down small farmers who are producing raw milk doesn't gain the federal and state agencies a lot of credibility. There are essential safe practices that are a part of farming, and some products like raw milk need even more than the normal safeguards. We can make that happen, but I see no movement from government regulators in understanding or enacting those measures. So we have to do it ourselves, and we are. On my end as a consumer, and on the farmers side if I'm going to be part of their herd share. In the meantime, pasteurization covers up for a host of problems on larger commercial farms. Let's make that milk safer and more nutritious as well. The start is to feed cows real grass in pastures, and stop all preventative antibiotic use, and start raising healthy animals so that antibiotics are used sparingly and rarely.Those two things would help the cows, increase the quality of milk, and begin the process of stopping the growth of antibiotic resistant bacteria. A great place to begin. Sat, Apr 3, 2010 : 8:31 p.m.
For those of you wno think that because people have been drinking raw milk for thousands of years makes it safe, guess again. I know raw milk tastes good, but there is a reason why there are laws regarding pasteurization. Before the pasteurized milk ordinance was passed, 25% of the foodborne outbreaks were attributed to raw milk consumption. People died of them fairly often. I wouldn't drink raw milk or feed it to my kids any more than I would lick a cow's udder. If you haven't gotten sick from it yet, you've just been lucky. Some bacteria like campylobacter can be hard to grow in a lab from food samples. Just because you go fishing in a lake and don't catch anything doesn't mean there aren't fish in there. Food safety and individual freedoms work both ways. People say they don't want government interference in their food choices, but the first time there is an outbreak in something like peanut butter or tomatoes, there sure is plenty of bellyaching about why the government isn't protecting the food supply. Can't have it both ways, folks. Fri, Apr 2, 2010 : 8:08 p.m.
Thu, Apr 1, 2010 : 8:45 a.m.
@eyeheartA2 - We may not have answers, but certainly we can help set the tone of how the questions are asked. The venomous attacks that seems to dominate the discussion are just so odd and curious to me. I'm a bicycle rider as well, and that topic has gone so far as local DJs advocating violence against bicyclists who dare use the road. I do approach the conflicts with curiosity - "why would someone want to do that?" (ride without a helmet, drink raw milk, terrorize bicyclists, etc.) and go from there. If we can help make the questions and responses calmer, friendlier, productive, and actually having content, then that's progress. Thanks for helping create that culture here. I appreciate it. Wed, Mar 31, 2010 : 6:31 p.m. Interesting question about the motorcycle helmet laws. I've been in favor of the law, but now I have to question why. I was pondering that this week when the issue came back up the same time as the health freedom concerns. Because it is so public? Because I'm concerned that motorcyclists are more subject to peer pressure and should be protected from that? The facts seem clearer, helmets save lives. But I have been questioning my assumptions and beliefs on this issue. Convincing the public of what are real risks is a difficult task. Walking to school may be safer than driving, but the perception is that kids are at greater risk walking out in public. How can we change perceptions, especially when they are fear based? It is a challenge. Wed, Mar 31, 2010 : 2:14 p.m. Wed, Mar 31, 2010 : 10:08 a.m. Wed, Mar 31, 2010 : 8:51 a.m. Eating anything is a risk. Think about how often people get sick from eating at a restaurant -- e. coli, hepatitis, cross-contamination with raw poultry. People should be allowed to make their own food choices and then live with them.